A campaign fundraiser to elect Dr. Patti Hill as LCI 3rd Vice President. Lion Patti Hill for 3rd Vice President! In Milan, Italy in July 2019, at our International Convention, Canada will present Dr. Patti Hill as our candidate for Third International Vice President. There will be at least one other candidate so there will be an election. As you will understand , running a campaign is expensive. Past International President Lion Brian Stevenson is sharing with us one idea for clubs who have not yet contributed to her campaign to help the campaign by running a Beans & Buns Diner (see his letter). We are looking for volunteers to sell Lion Patti Hill Pins as a fundraising activity. Please consider running this or other fundraisers to help with the campaign over the course of the next year. Please let the Cabinet secretary know your plans for helping this campaign. The target for the fund raising from all MD’A’ clubs is $50,000. Let’s see if we can raise more than any other District in MD’A’. Programming news, info on the guest speakers, and more in the fourth Convention 2018 update. APRIL 20 – 22, 2018. Time is running out for booking your room at the Holiday Inn Toronto Airport Hotel. We have a block of rooms waiting to be booked before the March 21 release date. That is when the hotel opens up rooms to the public. Please book now with our registration chair, Lion Al Teliatnik. The Huttonville Lions Craft & Antique Show will be held at the David Suzuki Secondary School, at 45 Daviselm Drive in Brampton on Saturday March 24 and Sunday March 25 from 10 am to 4:30 pm. Please see our flyer and dollar off coupon for the show. Calling all Lions, Lioness, Leos and Friends! You are invited to attend a special Opportunities for Youth Dinner to be held at the MD”A” Convention on Saturday, May 12, 2018, from 6-8 pm. To order tickets at $26.00 each, contact Opportunities for Youth Chair Lion Ev Spiering. Note: Luncheon tickets must be ordered and paid for in advance!!! A New Round of Items Are up for Grabs! Support LFC Dog Guides and enjoy auction thrills! There is no better way to bid on incredible items from across Canada than from the comfort of your own living room. The auction will run from Monday, March 5th until Sunday, April 1st with 100% of proceeds going towards the raising, training and placing of Dog Guides for Canadians with disabilities. Every Monday at 9:00am in the month of March, new items will be up for bid until Sunday at 5:00pm. Make sure to check back each week as we will have a new assortment of items available for bidding. Chair Lion Yves Drouin and the Lions CNE Peewee Committee are planning for this summer’s tournament! All Club donations will be recognized on signs at the LionsSnack Bar. We need your Club’s donations now, before the Lions Year End. Please make your cheques payable to District A711 Lions and label them for Peewee Baseball. The Lions Club logo is displayed at the entrances to the CNE, along Lakeshore Boulevard, as well as in the CNE program. Volunteers are needed to barbecue and serve customers at the Lions Snack Bar throughout the Peewee Tournament. Lions who volunteer will be given parking passes and free admission to enjoy the CNE. Enjoy a day at the ballpark, support young athletes, and help make this year’s Lions Snack Bar a great success! Toronto Netralya Lions Club is organizing a fundraising Gala “Indigenous Eye Health” for Anishnawbe Health Foundation (AHF) with the mandate “Excellence in Vision, Preventable Blindness and Diabetes”. The event takes place on Saturday May 5, 2018, 7:00 PM at AVANI EVENT CENTRE in Vaughan. TNLC has chosen Anishnawbe Health Foundation (AHF) as the beneficiary. The funds raised at the gala will support an “Eye Exam Room” in the new Anishnawbe Toronto health center building in Downtown Toronto. “Anishnawbe: Vision and Diabetes” is Lions Community Legacy Project and we need everyone’s support for this noble cause. This is the first time our Lions community has taken a lead to raise funds for “Indigenous Community of Canada” It is matter of pride for all of us. We are seeking help of every CLUB and inviting all Lions, friends and families to attend and sponsor this event and we will be looking forward to your involvement. Please support and help us in this humanitarian project. The Lions believe strongly that organizations which promote the physical and mental health of our youth, deserve the support of our community. Registration for players for the Freelton Minor Ball Association was held on February 24th and March 3rd in the building at the new ice pad in the Freelton Community Park. On both days, members of the Freelton Lions Club served free hot chocolate and hot dogs to the children and their parents. For many years, they have also served hot dogs and french fries on their awards night in the fall. 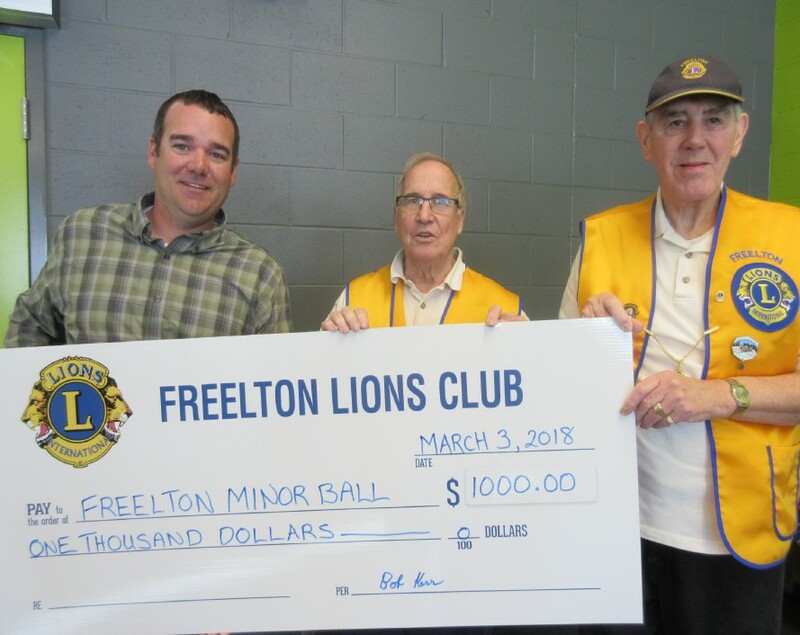 On March 3rd, a cheque for $1,000 was presented (left to right) to Joe Hoyles, President of the Freelton Minor Ball Association, by Freelton Lions Club President Bob Kerr, and Vice President Jim Cook. Hello, Friends of Lake Joe! With the melting snow and the longer days, it’s time for us at camp to start thinking about our busy season ahead! Lake Joe is fortunate to have a group of dedicated volunteers to help us out on our Clean-Up Weekend and we hope you will join us this year. Mark the date on your calendars, the Clean-Up Weekend will take place Friday, May 4 to Sunday, May 6, 2018. Volunteers for the weekend are invited to arrive on Friday evening around 6 pm. There will be a snack and some time to visit with old friends and make new ones as well around the campfire. On Saturday, we will spend the day beautifying our site! From getting the beach ready to pulling weeds at mini-putt, from touching up walls to wiping down our Muskoka chairs, there is something for everyone to do to lend a helping hand. After a day of working hard we would like to invite you to enjoy some of what Lake Joe has to offer – activities like pontoon cruises, fishing, tandem bikes, paddleboats, and so much more! Sunday morning we will have a nice breakfast together and then it will be time for to hit the open road. If you are interested in being a part of our Clean-Up Weekend, please contact the Lake Joe Camp office by responding to this email or calling 1-877-748-4028. Please note spaces are limited. We look forward to seeing you. Thank you for being a part of our community! One of our long time Nobleton Lions Club members (50 years) has passed away. Nobleton Lions and spouses will be having a Lions service for Lion Paul at Egan’s Funeral Home at 9:00pm after the visitation on Wednesday. Most Lions will be wearing their Lions shirts (most have black) and/or vests. Anyone is free to say a few words or an anecdote about Lion Paul. The Flyer & Registration form – Brampton, ON for the teachers’ workshop on April 7, 2018 to be held at Spot One Banquet Hall on Rutherford Rd S Brampton.